This is a continuation of a series of posts on the Nikon D850. You should be able to find all the posts about that camera in the Category List on the right sidebar, below the Articles widget. There’s a drop-down menu there that you can use to get to all the posts in this series; just look for “D850”. This is equally a post about the Sony a7RIII and is also tagged as such. In the last two posts, I summarized my thoughts on first, the D850 and next, the a7RIII autofocus accuracy. Now I’ll compare the systems on the two cameras. My conclusions may be affected by my choice of lenses. I tend to use the D850 for big, heavy, fast lenses, and the a7RIII for slower, lighter ones. Heavy lines are the means. Light ones are means plus and minus one standard deviation. 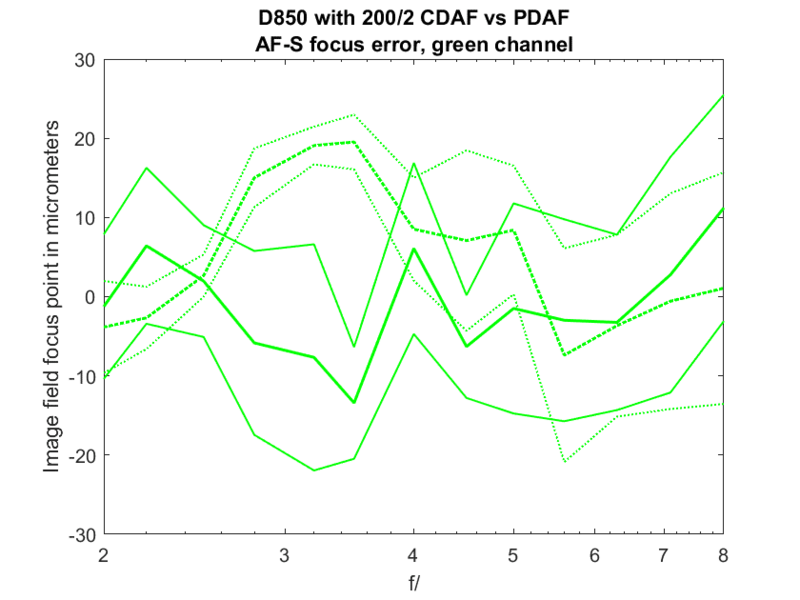 By convention, front-focusing is plotted as negative CoC diameters, and back-focusing as positive ones. The low spread of the a7RIII is due to my choosing the large spot size for the above comparison. For reference with respect to the circle of confusion (CoC) diameters, the pixel pitch of the two cameras is a bit under 5 micrometers (um). 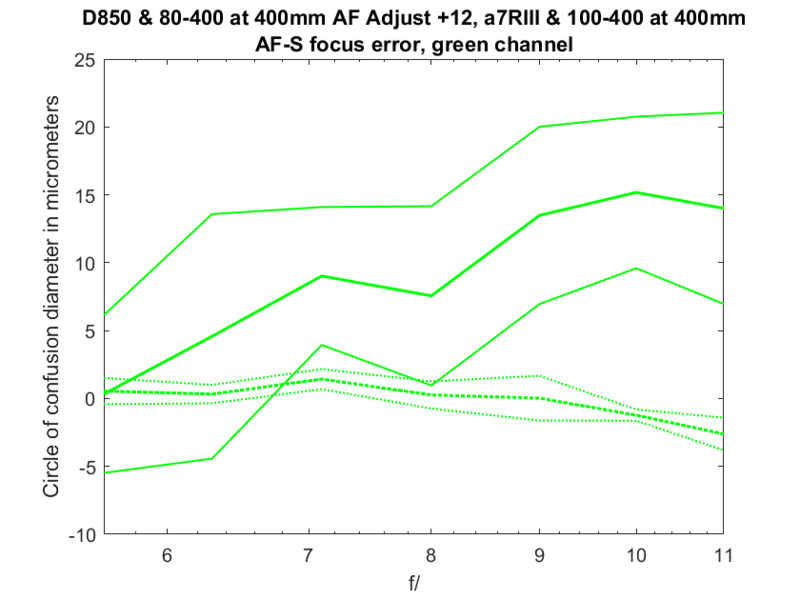 The a7RIII does not compensate for focus shift in AF-S mode, but at this focal length and distance (about 7 meters) the 100-400 has so little focus shift that that’s not an issue, and you’re better off with AF-S on the a7RIII. The D850 shows commendably low variation in face detection mode. There’s a pattern here that holds most of the time: when precisely tuned for the focal length and distance (as in the above plots), and also for the taking aperture (as was not done in the above plots; the tuning was done wide open), and the D850 uses face detection (and probably some of the other wide modes) the D850 can hold its own against the a7RIII. But start taking away those provisos, and the D850 starts to flag. Although Nikon does well in some of the prelims, the Sony wins the autofocus accuracy contest by the end of the competition. How does the Dual Pixel AF of Canon 5D4 perform? Is it comparale with this these two in terms of focus accuracy? Sorry, but I have no idea. I don’t use Canon equipment anymore. Is it safe to assume that A7RIII has the most accurate AF system on the market? 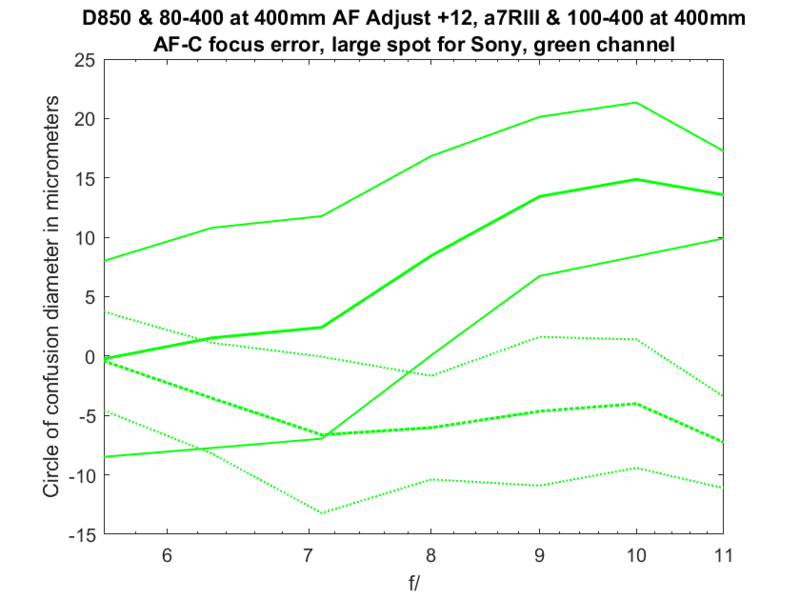 The focus plane variations in AF-C mode on those charts are mostly in less than 200 micrometers level. That’s hard to notice in real life use (other than macro) right? I think there has been a misunderstanding. There are three ways to quantify the location of the actual plane of focus in relation to that intended. The first is displacement in the object field. The object field is what’s in front of the camera lens. It’s what we photographers call the subject or the scene. I usually work with the target distance about 30 times the focal length. I usually see object field errors of a few to double-digit millimeters. The problem with using the object field displacement is that it varies with target distance and focal length. If we look at the image-field displacement — the error in the focal plane on the sensor side of the lens — that’s not the case. The downside to image field displacement is that it is not something that photographers normally think about (when was the last time you worried not about the depth of field, but about the depth of focus?) and that the numbers are hard to wrap your head around: a few to double-digit micrometers (um). I still use this measure but have found something that photographers relate to better. The more-friendly alternative to image field displacement is the blur-circle diameter. Another name for the blur circle is something that you may remember from depth-of-field theory: the circle of confusion, abbreviated CoC, in distinction from the capitalization of DOF. That is easily derivable from the image-field displacement and tells you the diameter of what would in a perfect world be an infinitesimally-small point on the sensor. The CoCs that we see in these tests also are usually from a few to double-digit micrometers. There’s a convention that I’m using that may seem strange, but I hope you’ll get used to it: negative values of the CoC diameters indicate front-focusing, while positive diameters indicate back-focusing. When you’re evaluating the CoCs and trying to get a handle on how they’d impact your own personal photography, one yardstick to keep in mind is your camera’s pixel pitch (the spacing of adjacent rows and columns on the sensor). That is usually about 5 um (4.3 and change for the D850, a hair more for the a7RIII, and about 5.3 for the GFX-50s). How about a MF comparison using the two cameras, an Otus lens and focus peaking ? MF comparisons are very difficult — and, to me, unpleasant — to perform, and are always open to criticisms about confirmation bias. I’d need to do many exposures for each situation, and somebody else, looking for different things, with a different target, might produce — heck, I’ll go as far to say would produce — different results. There are several things about peaking that exacerbate this situation. First, peaking is heavily target-dependent. Second, peaking is most effective when it is set so low that there is hardly any peaking showing when the target is out of focus. 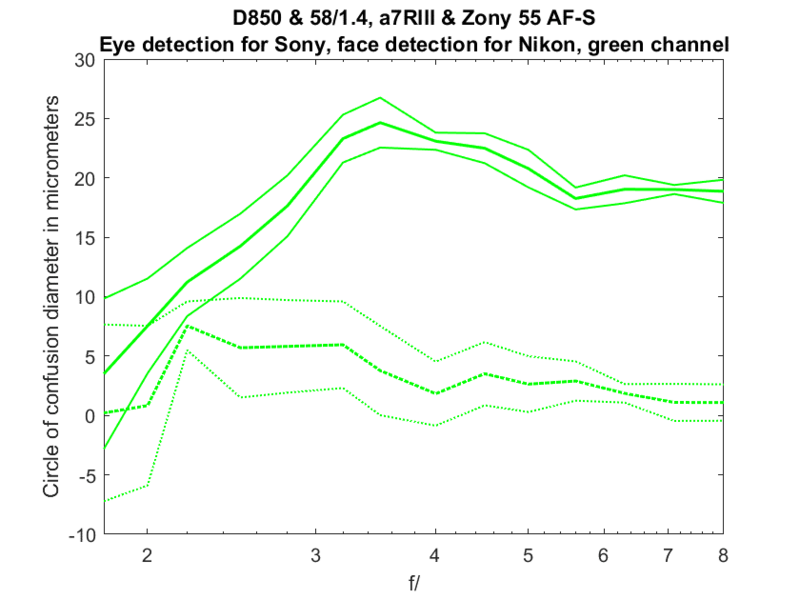 Third, on neither the a7RIII nor the D850 is peaking sensitivity continously adjustable so the odds that either camera will have optimal peaking are low, and the odds that both will are infinitesimal. So the playing field will never be level. So I don’t have any plans to do the test you asked for. Sorry. No worries. I would probably try it myself if I had a III laying around. I just won’t give any more money to Sony (or VW for that matter). You know, the best life-cycle deal I ever got on a car was the Audi A3 diesel. Bought it new for $35K, drove it for 6 years and 95,000 miles, and sold it to Audi for $24K. Still, I know what you mean. Dieselgate was corporate weaseling of the highest degree. And, incredibly stupid.